The Museum was very pleased to welcome Harry Verlander to Shoreham on Sunday 2nd May 2010. Despite the awful weather, it didn’t dampen Harry’s enthusiasm or that of visitors keen to meet him and to purchase signed copies of his brilliant book ‘My War in SOE’. Signing up to the Army in 1942 even though he was underage, Harry volunteered for the Special Forces and went on to serve behind enemy lines in Occupied France alongside the French Resistance and also in the jungles of Burma in bloody and terrifying hand-to-hand combat. 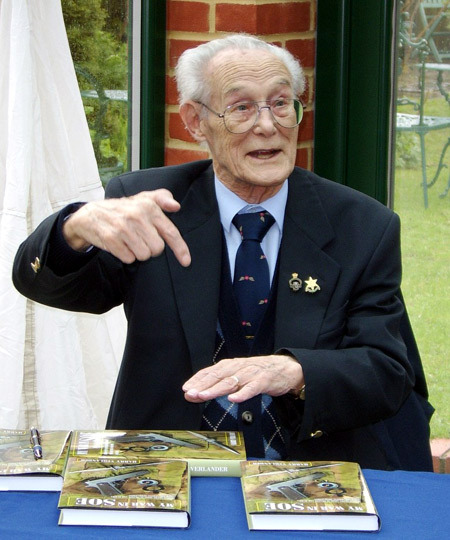 Having previously not been allowed to talk of his wartime experiences, Harry’s remarkable and brave story as a member of the Special Operations Executive is one deserving to be known by a wide audience. It is hoped that Harry will visit Shoreham again soon, so please check back for any news of another book signing date. You are currently browsing the Shoreham Aircraft Museum – News archives for May, 2010.